The day had been long and filled with the concerns and wonders of traveling from the desert to that mountain place…stiff legs wanted to stretch…confined body wanted release…and the heart wanted to burst with joy at returning to a place that had been branded as “home” in its core. 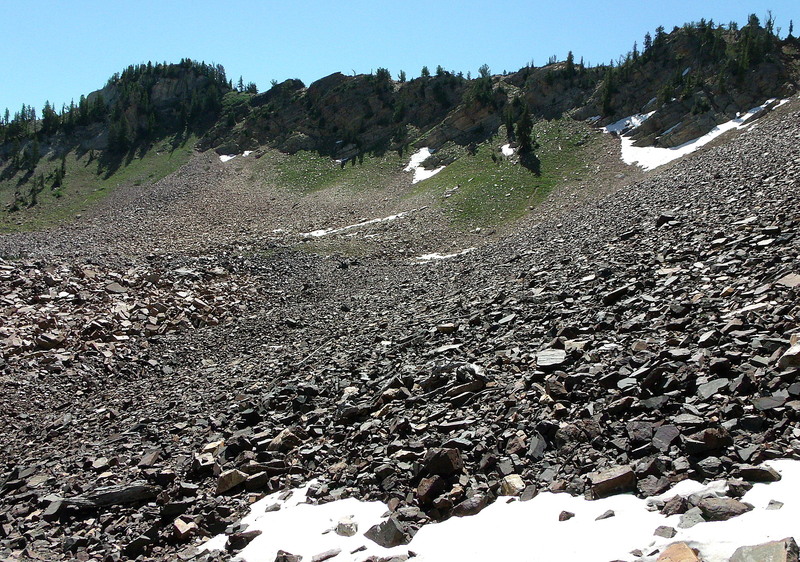 At 9,400 feet in elevation, this is under several feet of snow right now, but this is what Bells Canyon upper reservoir looked like in August, 2013. 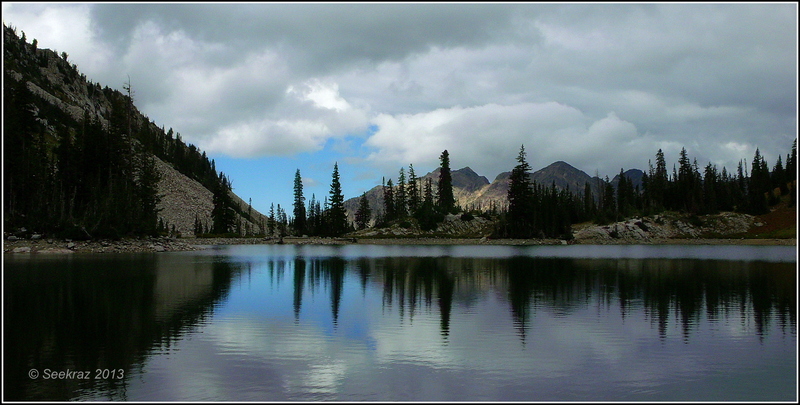 After a moderately strenuous, four-hour hike to reach the location, there is peace to be found along the shore of this desolate, alpine lake. 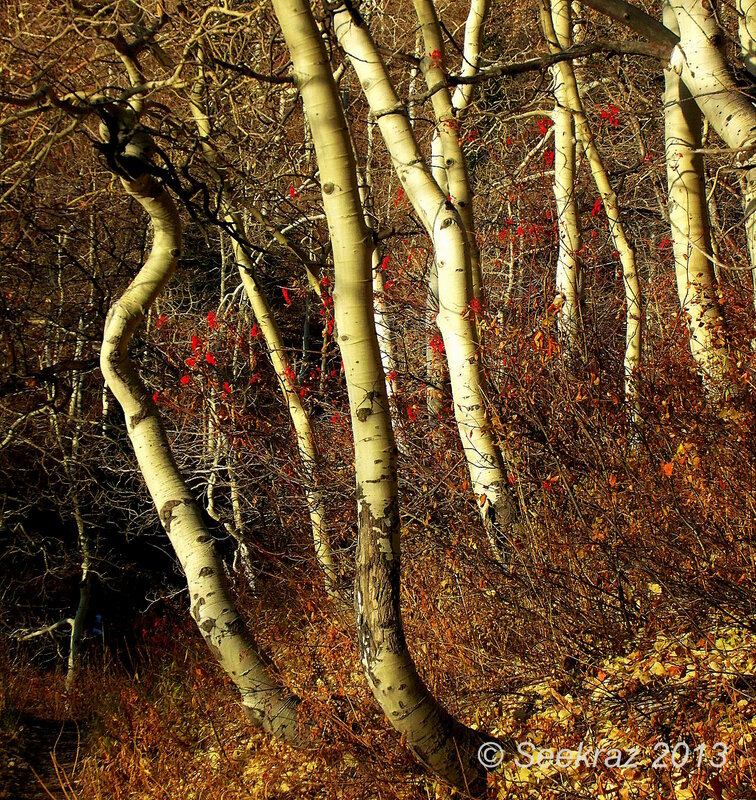 While there is no snow on the Salt Lake Valley floor, it will be another few months before the trails are clear enough for me to make the venture this far up into the mountains…and I can’t wait…..
Hmm…I suppose I should have gotten around to this one a while ago, as we’re approaching the end of the year and I made these images close to four months ago….the snow you see in some of the images is actually from last winter and we’re quickly approaching the snows from this coming winter. 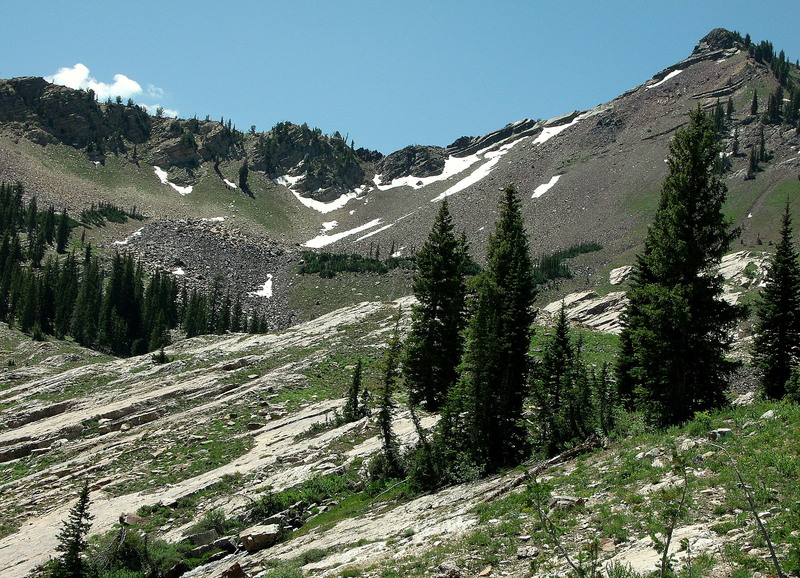 In fact, if I were to head back to Cardiff Fork today, I believe I’d encounter some new snow to share with you. 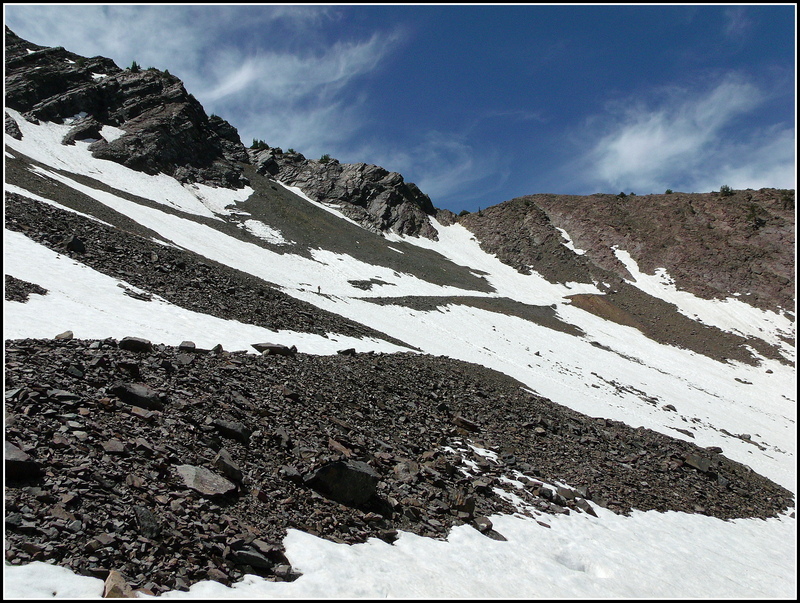 I don’t know how many of you have had the opportunity to hike into the mountains at the end of June, get all hot and sweaty, soaked shirt and everything, and then reach into a pile of snow and make a nice snow-ball to eat and cool yourselves down with, but it’s a wonderful treat! My son and I each had a large, grapefruit-sized snowball and it was fantastic…so refreshing! 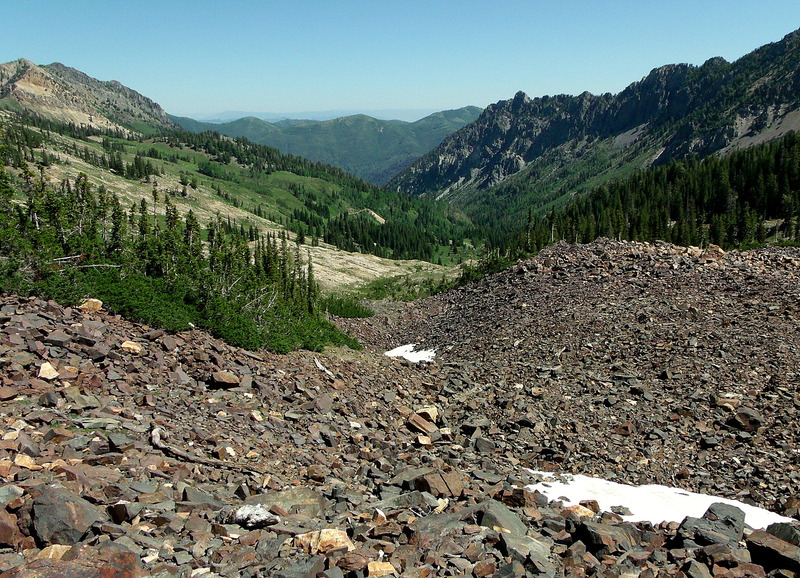 The above photo was taken while we were sitting at the furthest end of the fork…about four miles into the mountains, inside of the cirque that was full of broken basalt-looking rock that has tumbled down from the ridges above over the years. 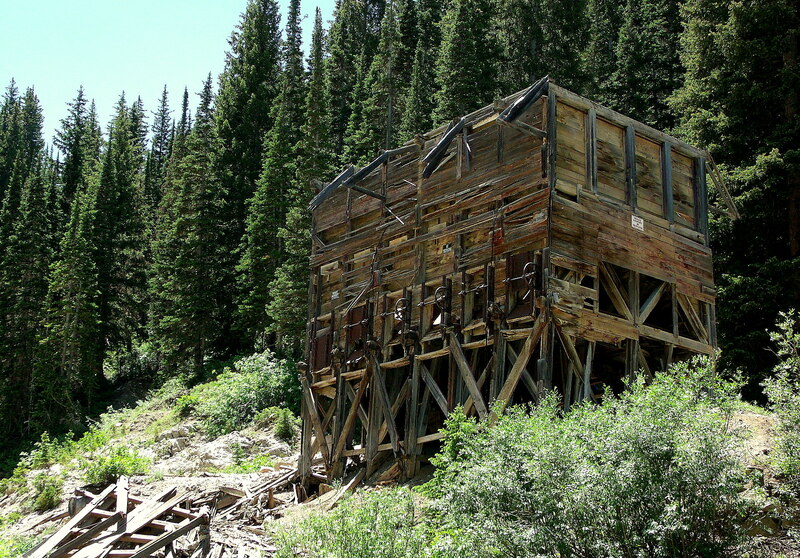 I don’t really have much more to tell you about the canyon/fork and its associated mining history, but I thought you might enjoy seeing a few more photos of the geography and beautiful landscape of the area. 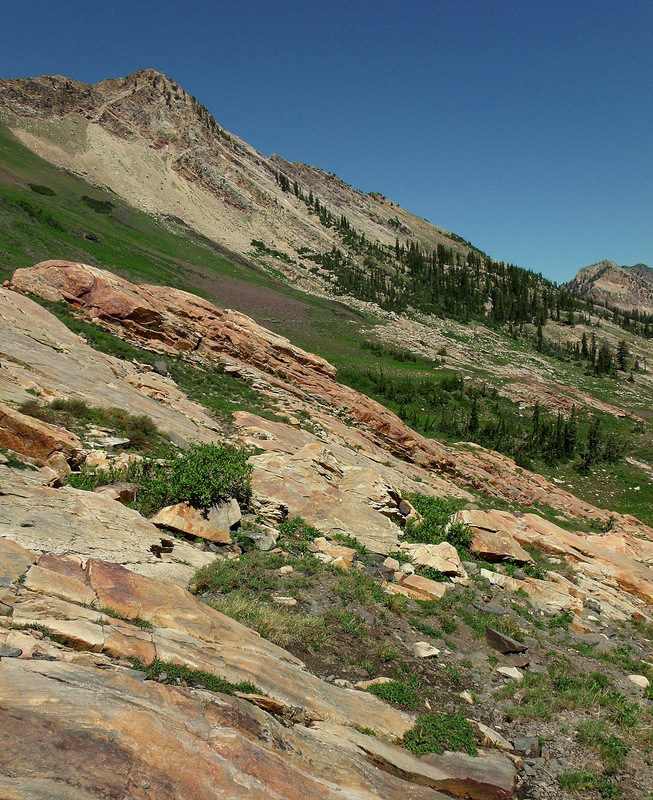 If we were to climb to the top of the ridge in the below photo, we would be looking west and into Mineral Fork…. If you can find the little finger of trees that is way down and to the left of the peak that is in the upper right corner (of the below photo), actually located between the center and right large pine/fir trees, that is where we were sitting while eating the snow-balls…where my son and I were sitting when I made the first and second photos above…we were just to the left of that little finger of trees…. 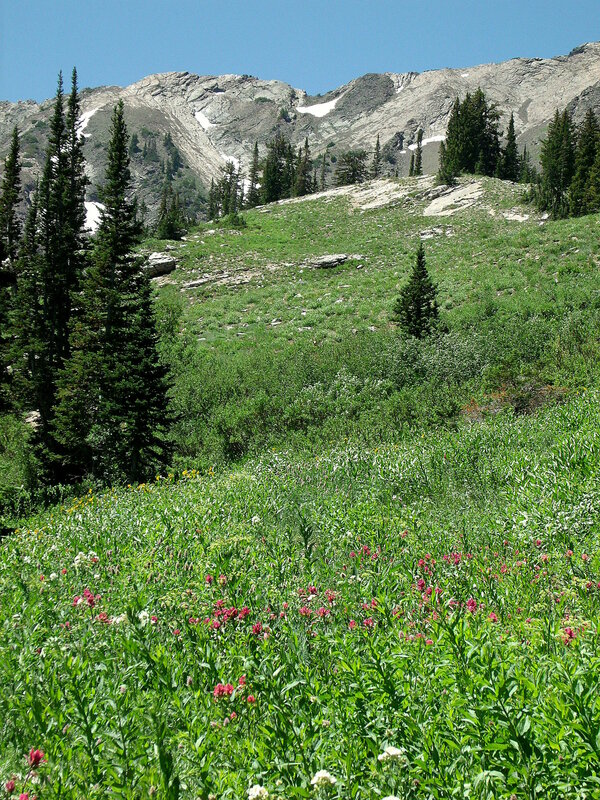 Also in the above photo, if you were on the ridge just below the clouds in the upper left corner, you could look south and down into Little Cottonwood Canyon…the little ski town of Alta would be off toward the left…and the metropolitan area of the Salt Lake Valley would be way off to the right….. 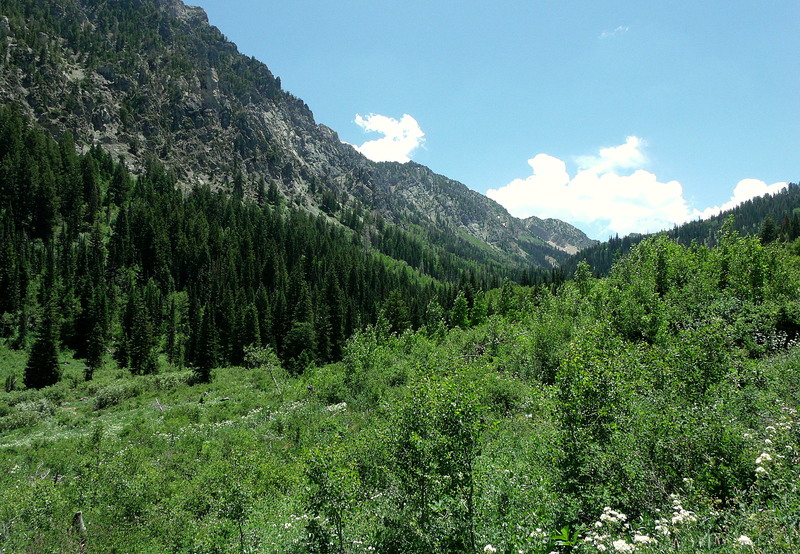 The below photo is from the other side of the fork, looking across the valley area and onto the old Cardiff Mine area. 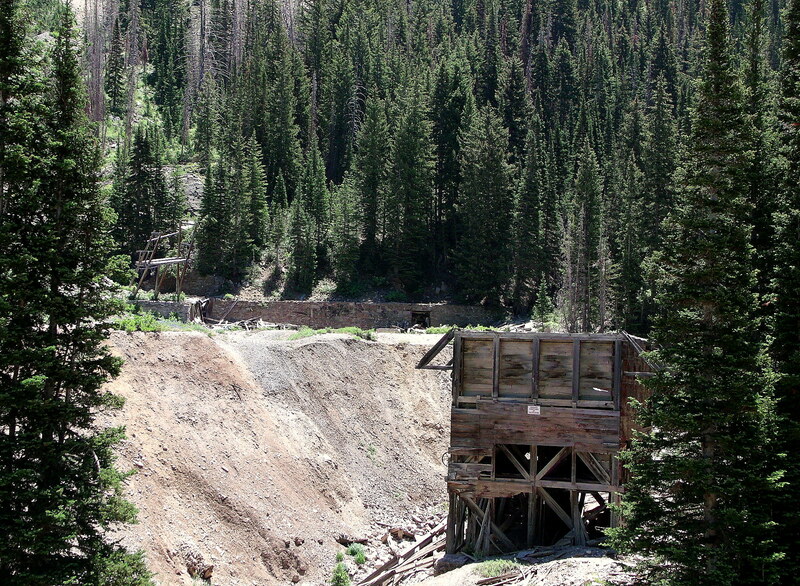 If you’ll recall the photos from the first post in this series, Cardiff Fork…beginning…, photo #8, that’s the same mine area that you can see in this below photo, but from a distance now, and with the ore sorter in the foreground. My son is providing a bit of perspective for us…he’s about 6’3″…so the ore sorter is rather large….. While my son’s not in the below photo, he was standing near the lower right edge/corner of the sorter and his head came to right about the center of that large beam that is right above the tree…. 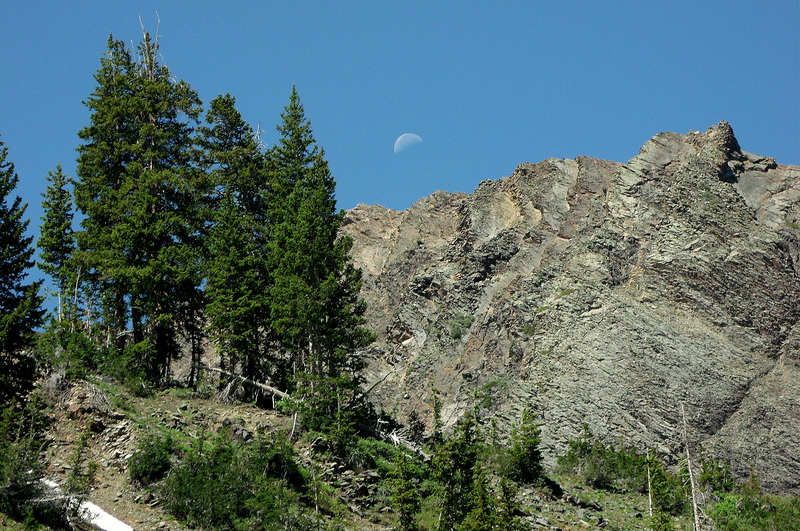 That’s all folks…I hope you’ve enjoyed the hike through Cardiff Fork. If you’d like to view all three posts from the series in one continuous stream, you can go to the bottom of the page and click on “Cardiff Fork” under the Category widget…that will bring you all three posts together. 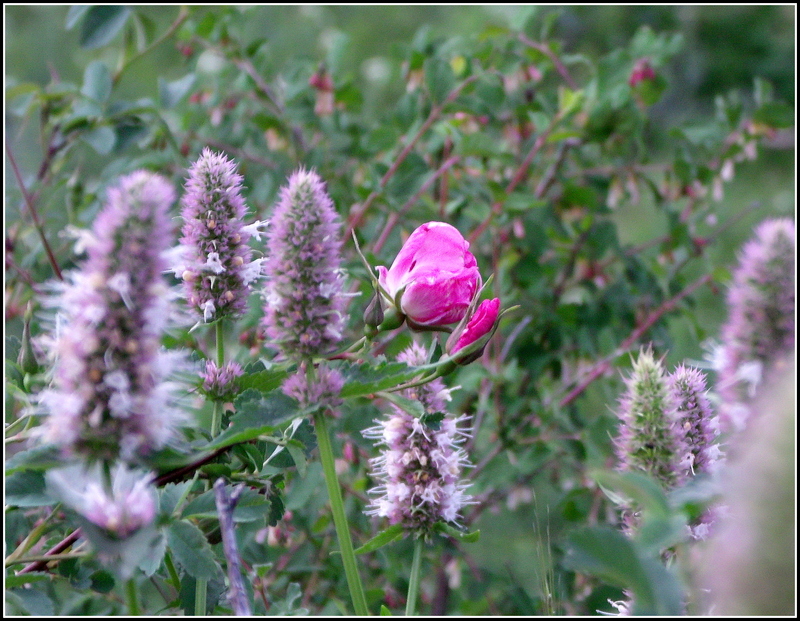 Thank you again for visiting and for spending a bit of your time with me…. I mentioned in an earlier post how my little one and I went fishing at Scofield Reservoir, about 100 miles south and east of Salt Lake City…and how we didn’t come home with any fish. We did come home with some photos of birds that we had never seen, though. 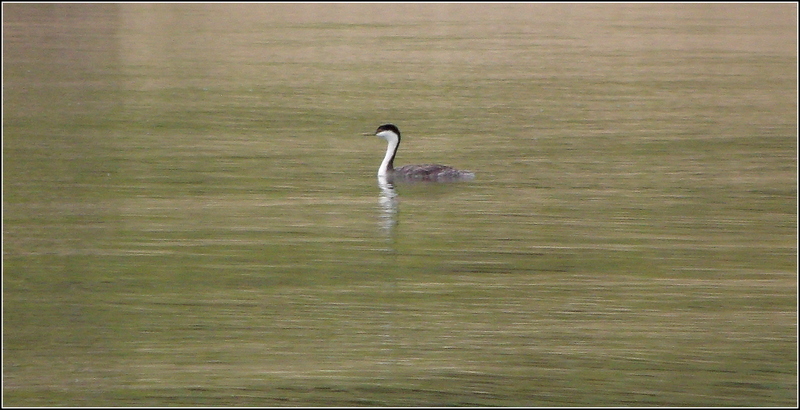 Below is a Western Grebe, not to be confused with a Craig’s Grebe. The most significant difference, to my novice birder’s eye, is that the black hood goes below the eyes on the Western Grebe and remains above the eyes on the Craig’s Grebe. 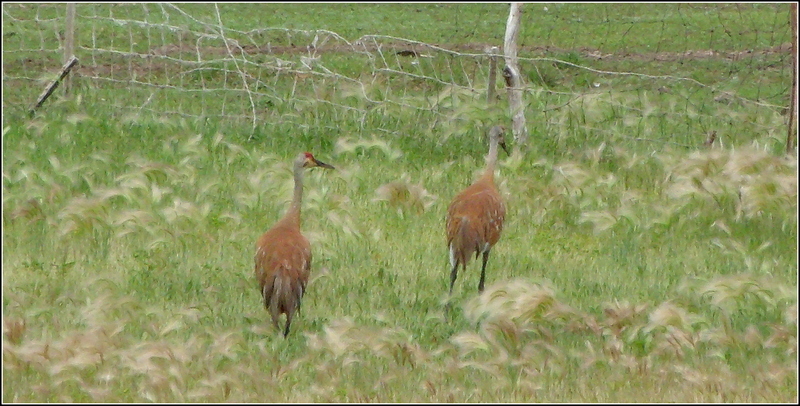 The next two photos are of Sandhill Cranes…. It was unusual to see such large birds walking near a lake/reservoir way up in the Mountain West area of Utah. I have read that our region is along the migratory routes of many types of birds, but just hadn’t seen much of anything that fit the definition of such birds yet. One of the sources that helped me identify the birds showed photos of large gray birds with the red forehead, so I thought I was wrong about their name, but then they also showed other photos similar to these guys, indicating that the migratory cranes are usually scruffier and brown, while still keeping their red forehead. 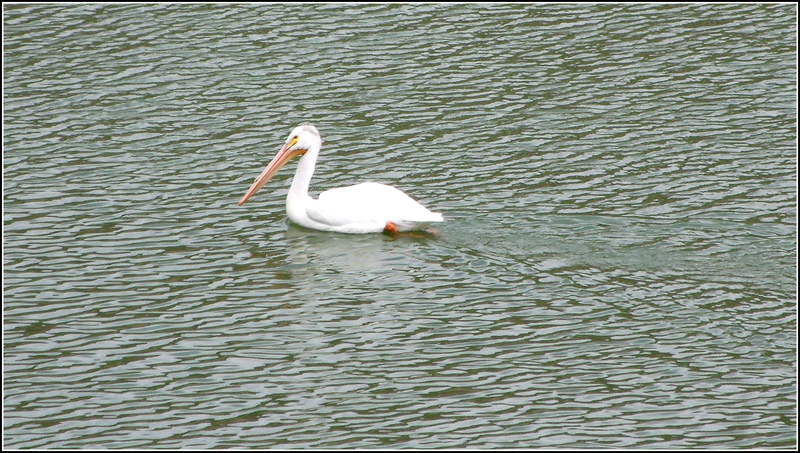 And lastly, here’s an American White Pelican…way the hell out in the mountains and hundreds of miles away from any ocean. 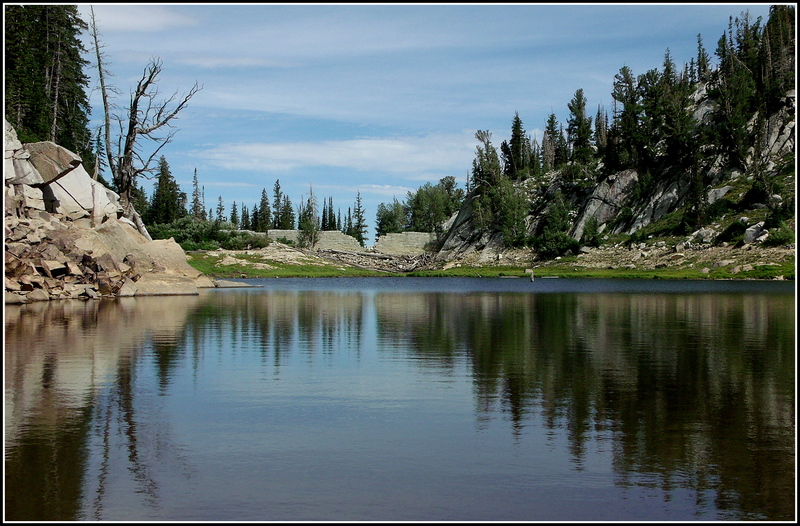 The link states that they breed on lakes throughout the northern Great Plains and in the mountain west, but winter along the coast. I guess they can pretty much go wherever they want to. I thought it was nice to find them where we did. There appeared to be a huge flock of the large birds waaaay off in the distance, but this one was the closest I could capture for a clear photo. Yes, sometimes…after a very long hike when I’m falling asleep and it feels like my boots are still on and the trail is still beneath my feet…when the sounds of the forest whisper quietly in my mind…chuckling streams and the breeze flowing through pine needles and leaves…sometimes then…sometimes in the middle of the day after a Yesterday’s hike, images come unbidden, scenes flash before my mind’s eye as I’m reaching for a pen or typing words into the screen…a flower-speckled meadow, silvery snail tracks across the trail and morning dew on a spider’s web, white broad-petaled flowers tucked into the shadows swaying…craggy skylines, and waterfalls drumming-up a mist before my eyes….yes…sometimes…. 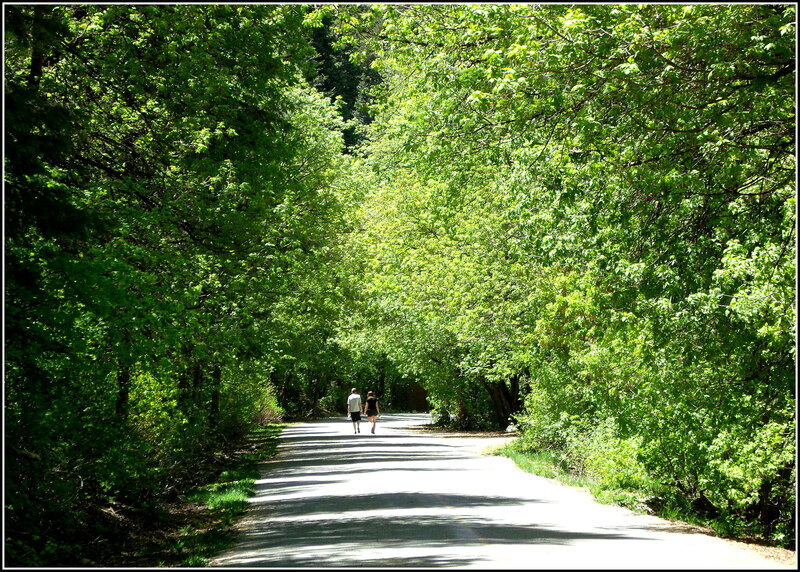 The “winter gate” is still closed in Millcreek Canyon…allowing pedestrian and bicycle traffic clear passage to the end of the road without the interference of motor vehicles, excepting the occasional motorist who actually lives or stays at one of the cabins further into the greenwood. The road is closed from the first of November until the first of July…or I could say that it’s only open from the first of July to the first of November…at any rate, here’s another glimpse into the marvelousness of full Spring in Millcreek Canyon…the snow is gone and the Green has returned…and it’s a beautiful place to take a walk….. 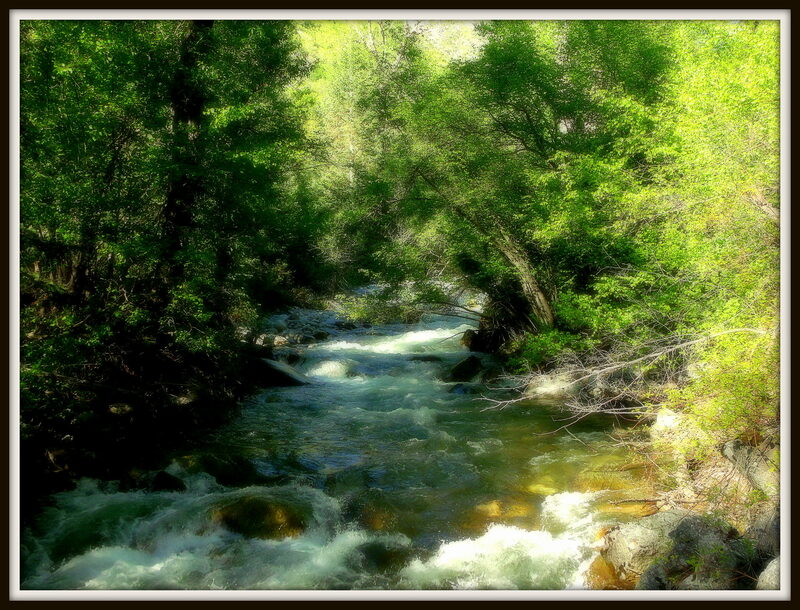 If you’d like another look at the green explosion that is MillCreek Canyon in season, you can visit my post from last July for another saturated view of the place, Millcreek Canyon in Green.